Hi, beauties! I’m very excited about the product I’ll be sharing with you today because it’s quite possibly one of the best black eyeshadows I’ve ever tried. This baby got a whopping A+ grade from Temptalia and I wholeheartedly agree. At $32 it’s an insanely expensive eyeshadow. I was blown away by swatches of #13 and made a mental note that one day it would be nice to own it. A few months ago I saw #13 discounted in a blogsale and said to myself: “It’s now or never.” Was this purchase motivated by a “it’s on sale/discounted” mentality? Yes. Would I have gotten it otherwise? At full price, no, I don’t think so. $32 for one eyeshadow?! Yikes. However, I’m very glad I got it. If you rarely wear black eyeshadow, #13 probably won’t seem like a big deal to you. However, I looove my black eyeshadows. They’re great for setting gel or liquid liner (specially the really shiny ones), smudging along the lashline, and (of course) creating sultry smoky eyes. During the nighttime I like my black eyeshadows to be really black. When you’re in a dark place (a restaurant, a club, etc.) and you get your picture taken with flash, you may have noticed that the flash washes out your makeup. I’ve always wanted to find the darkest black eyeshadow out there. It’s not easy though, blacks are hard to formulate, particularly mattes. Anyways, as you can see from the swatches, #13 puts my other black eyeshadows to shame. I must point out that the MUFE #4 and MAC Nehru eyeshadow look disappointing when swatched on my arm but they look great on the eyes. Besides ETK #13, my absolute favorite is Urban Decay’s BlackDog. I think the pressed powder texture of #13 helps it glide on effortlessly. Don’t be intimidated by the crumbly texture though, once it’s on your skin it becomes almost creamy. The Giorgio Armani Eyes To Kill Intense Silk Eyeshadows are basically identical (in terms of formula) to the L’Oreal Infallible Eyeshadows (well, they do belong to the same parent company) so these two are pretty much dupes. I know there’s a black shade in the L’Oreal Infallible range but I don’t own it (also it has shimmer, #13 is matte). I previously posted a smoky eye look using #13 in case you want to see it in action. 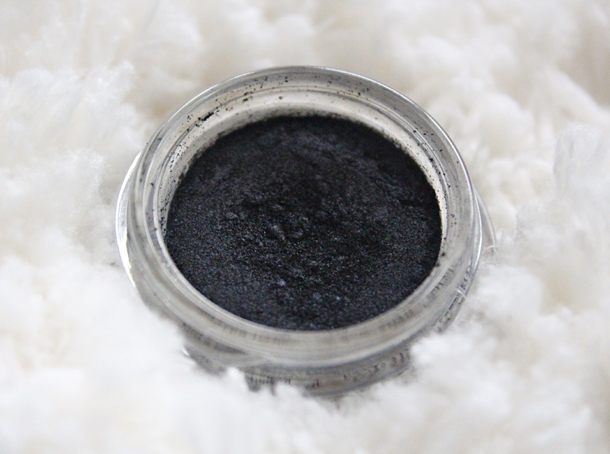 What’s your favorite black eyeshadow? I usually use gel liner and then smoke it out with MAC Carbon for my outer V. I want to try makeup geek shadows….I heard she has a very black matte in her line. Thanks for sharing! I think I tend to use a simple black eyeshadow by Rimmel, really cheap too 🙂 I can't now think how dark it is as I haven't used it for a while, it may however be worth a look. Wow, that is super black! I agree that black eyeshadow is so useful for the lash line and to intensify liner… love it for nights out 🙂 I've used one by Bourjois that works well, but I don't think it's as dark as this one! Wow it is black! But $32!! Wow, the ETK is miles ahead compared with the other eyeshadows in your swatch! Glad that you managed to pick this up on sale and it didn't disappoint. Such a dark and even slight shimmer! This is huge on my highend wish list! My favourite black eyeshadow is from my naked palette. It's quite dark in my opinion!